Operation Finale may be an often gripping take on the hunt and capture of elusive Nazi war criminal Adolph Eichmann, but it finds emotional power in the intimate characterizations of two truly gifted actors. 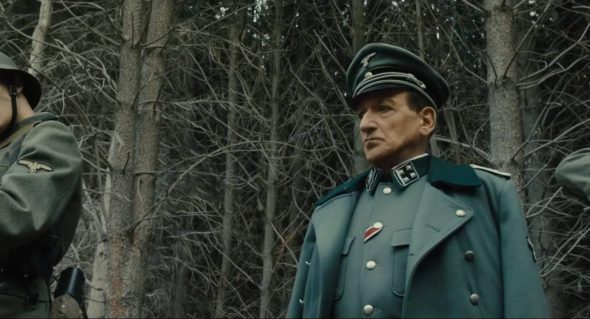 Sir Ben Kingsley is Eichmann, the SS “Head of Jewish Affairs” who lived under a false identity in Argentina until an Israeli Mossad unit tracked him down. Oscar Isaac is Peter Malkin, the Mossad agent who entered into a psychological duel with Eichmann while negotiating his extradition for trial in Israel. Director Chris Weitz handles well the shifting timelines and changing locales, propping the historical dramatics up with tense staging reminiscent of Argo. And, as he’s not had any recent head injuries, Weitz knows when to stay out of the way and let his two leads do the masterful things they do. The trouble spots in Operation Finale come mainly from Matthew Orton’s script, which is ironic because many isolated moments are quite effective. Much of the dialogue is breezy and even funny, which humanizes the supporting characters (with fine work from an ensemble including Melanie Laurent, Haley Lu Richardson and Nick Kroll) but can feel a bit flippant inside such weighty history. And in weighing that history, Orton’s first feature screenplay aims for meaningful statements on the casualness of evil and the moral ambiguities of war, but settles instead for well meaning generalities that don’t amount to any unique vision. Kingsley and Isaac (who also earns a producer credit) provide their own. Their scenes together become a richly-drawn cat and mouse game, a face off between personifications of genocide and exterminator. Somehow, they make subject matter this unpleasant a joy to watch unfold, elevating Operation Finale with a moving contrast of soul.